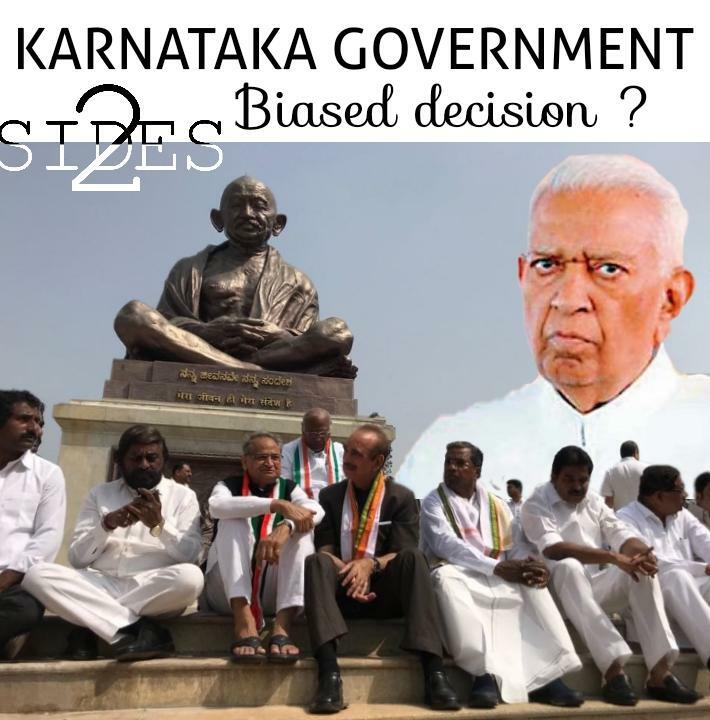 HomeSouth IndiaKarnatak Governor's Decision Arbitrary? Karnataka elections threw up a hung assembly with BJP becoming the largest party with 104 seats, falling short of the required 112 seats to form a majority. The Congress-JD(S) post-poll alliance has 117 seats. The Karnataka Governor Vajubhai Vala called upon the BJP to form the government and BS Yeddyurappa was sworn in as Chief Minister on Thursday. What happened in Karnataka is a clear and blatant abuse of power by the Governor, whose roots lie in RSS and BJP. Even when the majority of the seats in the Legislature belonged to the Congress-JD(S) alliance (with the Congress offering unconditional support to JD(S)), the governor calling upon the BJP which is short of 7 seats to form the government is illogical. The claims that it is natural for the governor to call upon the largest party to form the government is farcical as well as an attempt at gaslighting the population. In Goa, Manipur and Meghalaya, the Indian National Congress' claim as the single largest party was completely ignored by the respective governors(all of whom were affiliated to BJP and/or RSS) as various poll alliances stitched together by the BJP was called to form the government. How can the same constitution allow for different interpretation of the law in differenet states? The BJP is attempting to bend, break and subjugate the system to their will. Considering the Congress-JD(S) alliance has already been publicly declared and the supporting 117 MLAs consent given in writing, the only possible way for a BJP government in Karnataka is to indulge in practices of horse trading and party splitting. The governor's decision - to call the minority BJP government and giving them 15 days to prove themselves on the Assembly floor - is thus tantamount to the Centre, whom the governor represents in a state, backing such immoral and undemocratic practices based on money and muscle power. The BJP has mastered the art of winning elections, clear from the fact that despite having a 1.2% lower vote share than Congress, it emerged as the single largest party in Karnataka. But in its raw lust for power and to fulfil its self-proclaimed goal of Congress-mukt Bharat, the BJP has unfortunately reduced the Indian democratic system to a caricature of itself. The constitutional powers vested in a Governor gives him the discretion to call the party or group he thinks can form a stable government in a state after the elections. The Supreme Court of India has time and again upheld these powers through various rulings. Of the parties that stake claim to form the government, the custom has it that the Governor give first preference to the single largest party to take the floor test. This is exactly what happened in Karnataka. The BJP as the single largest party staked claim to, and was thus allowed to, form the government. This is different from the Manipur, Meghalaya and Goa decisions as in those states, despite being the single largest party, the Congress did not stake claim to form the government. Not one to be caught napping, the BJP, and its alliances in these states, staked claim, had the first mover advantage, and thus were thus allowed by the respective governors to form the government. All the drama now unfolding is but the desperate cries of a party rejected by the Kannadigas (and India too, except for Punjab, Mizoram and Puducherry where it still clings onto power) trying its best to subvert the democratic process. No law has been broken as claimed by the INC, on the contrary, the BJP is playing very much by the rules. It is ironic that the INC is accusing the BJP government of abusing the powers of office, considering they themselves are guilty of blatantly multiple and brazen transgressions of decency and decorum during their own years in power. If anything else, the poll results show the incompetence of the INC to lead the nation and are a testament to the political brilliance of the BJP president Amit Shah.